Guardians of the Arches is a tenants’ association formed from a national collective of small business owners, based in railway property. As small businesses we are the backbone of our local economy and we are committed to seeking justice and fairness for all. As a tenants’ association we are seeking to bring together all those who reside in Network Rail property to ensure that our rights and interests are protected. We have the potential to be one of the largest associations of its kind in the UK. 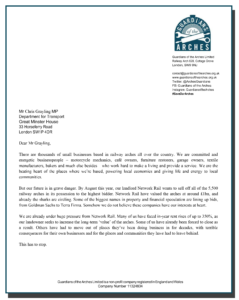 Network Rail is currently the largest landlord to small business in the country. Its 7500 railway properties are home to a huge variety of trades - furniture restorers, metal-shop workers, café owners, hairdressers, tyre sellers, brewers, distillers, community spaces, galleries, specialist food stores, artists, gyms, motorbike repair shops and everything in between. In 2017 Network Rail unveiled plans to sell off its railway arches in one job lot, leaving thousands of small businesses facing an uncertain future. That sale, to Telereal Trillium and Blackstone, was announced in September 2018 and is due to be completed by the end of this year. We formed Guardians of the Arches to represent the interests of those small businesses. Our campaign in the run up to the sale achieved great success. Thousands of supporters backed us, and we received weekly high-profile coverage across radio, TV and national newspapers (including several front pages). We also took our case to Parliament and government, with MPs and ministers from across the spectrum supporting our cause. Our potential new landlords have took notice, and promised a “tenants first approach”. But we don’t yet know what that means in practice. As an organisation, together, we will ensure that these aren’t just warm words. 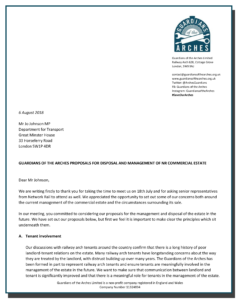 Whoever owns the arches, we will hold them to account. For businesses based in arches, we are asking for a membership fee of £100 per year. We aren't funded or sponsored by anyone; we are simply a group of tenants and successful business owners from London, Leeds, Newcastle and Manchester voluntarily working together, with the donated time, and expertise of the New Economics Foundation and the East End Trades Guild. Access to comparable rent data, collective procurement power, discounted maintenance and security supplier agreements and national trade networks. Workshops and events around the country to provide support which will better equip each of us in understanding our leases and negotiating effectively. But all these things, along with our ongoing campaigning for tenants' rights and affordable rent, require an administrative function which we need to fund via membership fees.